Up on Stanage Edge, not far from the trig point, are a number of millstones, stacked like giant piles of stone coins. These are left over from when millstones were quarried there. They make a great subject, however the light was really poor the evening I was there, so I settled for a few close up images, along with some wider shots to give me an idea what I can expect when the light is good. It’s certainly a location I would like to revisit. Spoiler Alert: If you wish to experience the joy of discovering this location, then read no further. 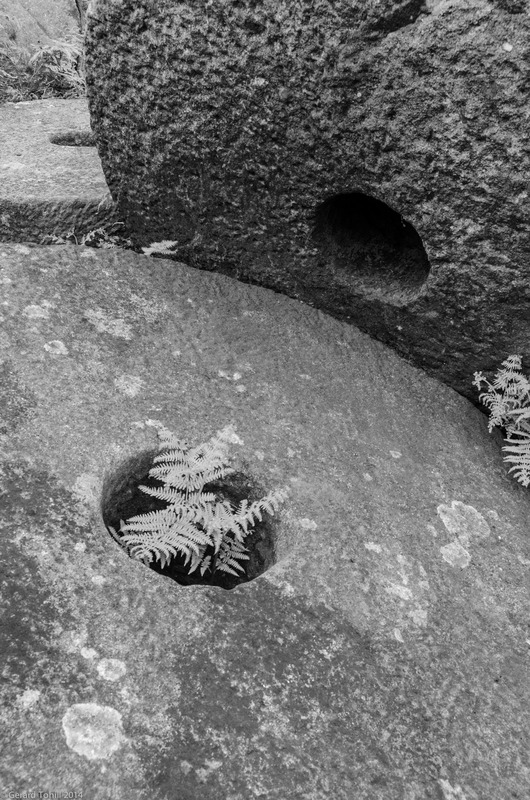 To find the millstones, first park at Hook’s Car Park near Hathersage. Take the obvious path heading up to Stanage Edge, heading towards a slight dip. On the edge, turn right and head along the path, with the steep drop on your right. When you reach the trig point, work your way carefully around and down to the right – the millstones are below a short vertical section of gritstone.